Links are working fine for me on Waterfox. Here's my idea. Ritual-style cards are usually not done in black anymore but in Ice Age, with Dark Ritual freshly reprinted, this would have been no problem. Destroy target land. If you control no nonsnow permanents, that land’s controller loses 5 life. Destroy target land. If that land was snow, you gain 5 life. As of 2017, MaRo lists land destruction as secondary in black, but I'll count it, since land destruction as a whole is something that WotC doesn't do as much any more. All right, I should probably get to judging this. viriss - I actually remember having An-Zerrin Ruins, back in the day. Definitely fits the bill of things red doesn't do any more. Interesting design on this one, and seems fitting to the theming. I waffle a bit on the balance, though. On the one hand, it's a strictly worse Ruins, on the other, it's still a very playable card. The upkeep is thematically appropriate, but I think with what is essentially a timer on it, this could have been at least a 4/3. Jartis - Once again, a card with an inspiration that I remember having. A bit different from typical red ooze, which all focused on growing over time, but that's not really a point against it. Caring about snow and locking down lands are still great theming. I think what I would have liked to see is having it maybe care about all lands, not just the controller's, and spread snow rather than just throwing tempo. It's still a good card as-is, and I wouldn't be surprised to see it in a booster. ameisenmeister - Hoo boy. Exponential card draw, with a delayed-reaction Channel built in. That's some high risk, high reward gameplay. Which is admittedly just the way black plays, but I worry this could be a little strong. Black had a few options for life gain in the Ice Age block, and has gained plenty more since. At CMC 2 and with a mana kickback when you let it die, I can see this being used to set up some gnarly advantage too early on for other players to deal with. gluestick248 - I'm normally not a fan of land destruction. I think this works, though. Better costed than, say, a Stone Rain, and encourages going heavily into snow. Not much more to say about it. This is a good way to do black land destruction if you're going to do it. Everyone had pretty good cards, but for my winner, I pick Jartis . I have fond memories of running oozes, and as paradoxical as "aggressive stalling" sounds, it fits red perfectly. Thanks for the win! Oozes are my favorite. I've slowly been building and improving an ooze deck over the past few years as new cards come out. 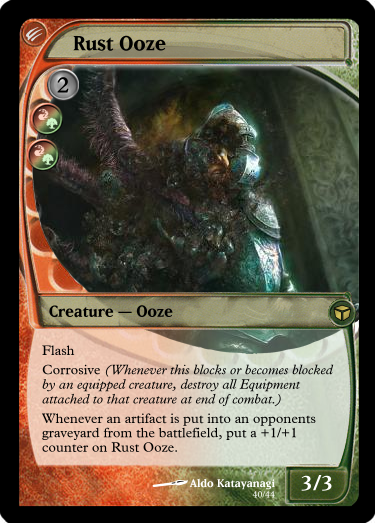 My main issue is the lack of ooze-themed instants and sorceries, but there are a few, at least. For the next set, we're going to look to the future...past? It's Future Sight, we're doing Future Sight. And in keeping with the theme, the special challenge is that the card must be futureshifted. 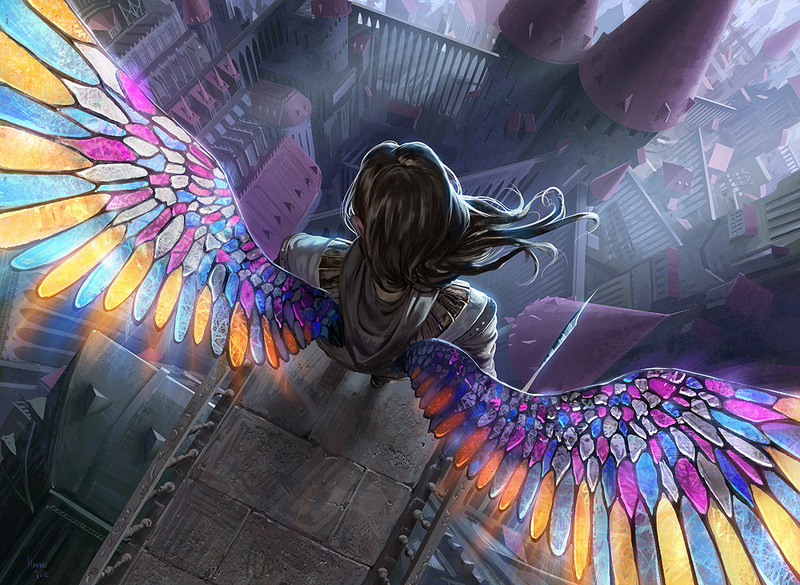 As Gamepedia puts it, in Future Sight, "Each of the cards features some quality that has never appeared in the game before, such as a new keyword ability (Fleshwrither), the application of a new keyword for an old ability (Thornweald Archer), or even referencing cards and card types that do not exist yet (Goldmeadow Lookout, Steamflogger Boss)." I'll be pretty lenient with this restriction; you can do a completely new mechanic, a mechanic that wasn't out at the time of the set but is now (like Enchantment Creatures), or even just using a mechanic they came up with in this set like Gravestorm or creature lands. Honestly, it's pretty open, just have fun with it! When Witwalker is put into a graveyard from anywhere, each opponent draws a card. Future Sight introduced shroud, so I guess it makes sense to use it instead of hexproof. To be honest, I'm not entirely happy with this one, but I think it works. My thought process here was that protection, artifact hate, and enchantment removal are all things Green can do. Combining them into something that disenchants and unequips everything on the board and keeps it that way for the turn is something that's a bit outside of green's current wheelhouse, but something it could do. 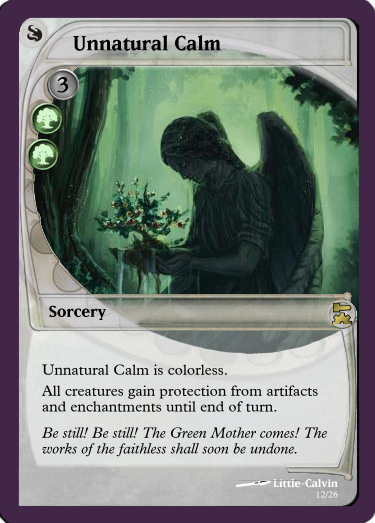 Making the spell colourless, naming it as Unnatural Calm, and the slightly ominous flavour text all hint at something more sinister, like an eldrazi or similar. Last Edit: Jan 26, 2019 11:57:34 GMT by kefke: Added reasoning. The idea behind this is that the future legends and histories of Dominaria were written down in this ancient tome. At the beginning of your end step, if you control a tapped enchantment, you gain 4 life. 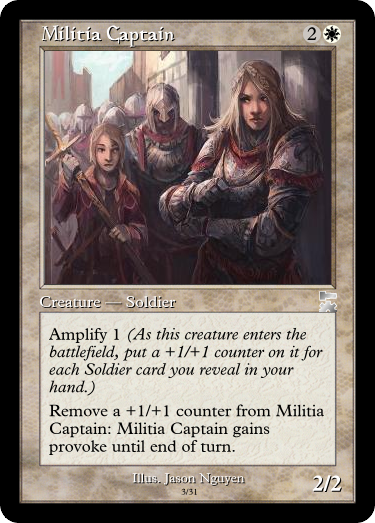 When CARDNAME enters the battlefield, put each creature you control in a single-file line. Whenever a creature enters the battlefield under your control, you may put it at the front or back of the line. 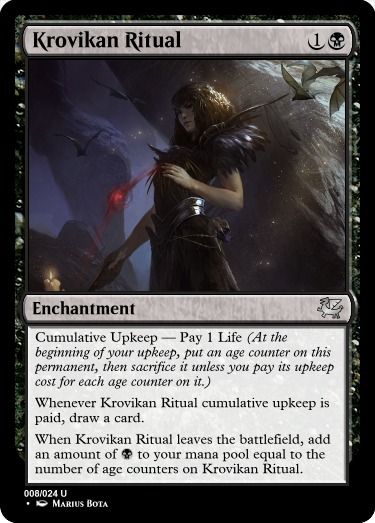 Sacrifice a creature: Each creature behind it in the line gains hexproof and indestructible until end of turn. Whenever CARDNAME or an enchantment with a subtype enters the battlefield under your control, if it doesn’t share a subtype with any other enchantment you control, creatures you control gain double strike until end of turn (Enchantment subtypes are Aura, Curse, Shrine, Cartouche and Saga). Wanted to futureshift Sagas, but that was almost impossible with the Future Sight frame, so I went with Tarmogoyf style. Also, I wanted to make a render but my Future Shift template doesn't show mana symbols. Because, I guess, reasons. Whenever fortified land becomes tapped, create a 1/1 green Elemental creature token. Closing in about 48 hours, get in any final entries or edits. Really happy with the turnout this time. Flo00 Instantcycling would be really nice, and honestly I could see it in red as well as blue, but I think it works well here. Other than that a 3/3 for 3 with shroud is pretty solid for blue. kefke Colorless clause is an interesting choice. I'm not sure it's entirely necessary, but I get it from a bit of a flavor perspective. I do like the almost existential horror vibe it has, for what that's worth. The main thing is that it's a bit of a setback for equipment, since you'll have to reequip everything next turn, but it's really bad for auras, since they'll be sacrificed once they're no longer attached to valid targets. Tesagk A bit costly for what is essentially Sol Ring, but obviously in a deck that cares about "historical" spells, it's a great enabler. viriss Corrosive is a fun new keyword in that it is both flavorful and "predicts" effects like Corrosive Ooze, which I'm sure was the intent. I might say it's a bit undercosted, even though it's a 3/3, because of flash and the potential to immediately skyrocket against certain decks. Especially when you consider this card would likely be in a sideboard and only brought out when it could be used to great effect, like against Voltron decks. crimsonreaper Enchantment artifact. Interesting. So, presumably, it has to target a creature as it enters the battlefield, but can be moved for its equip cost later? I'm not sure how the rules for it being an aura conflict with the rules for it being equipment, since auras are sacrificed when they're not targeting a valid target. gluestick248 Ah, tapping enchantments. Hello Storm Scale, my old friend. And another enchantment artifact as well. I love the implications behind them. That said, in this instance, maybe a bit too powerful? Once you activate it, you get the benefit of both the activation and the subsequent trigger, essentially making for 3 mana life gain and creature buff. And as weak as life gain can be, 4 life a turn is nothing to sneeze at, especially when you're getting secondary benefits as well. Fleur de Violet Oddly enough, with the success of games like Yu-Gi-Oh, and Richard Garfield's recent Keyforge, I could actually see Magic having a "placement-matters" battle line. As flo00 mentioned, though, Future Sight introduced shroud, and I don't think they would have included "better shroud" in the same set. mrlozano Just dropping a card type like that was totally something they did (and sometimes still do), I'm just not sure how I feel about it. With True Conviction coming in at only one mana more, this seems like a bit of a stretch to fit into most decks, especially since it would take a full six turns to get maximum use out of it (barring the lose of the enchants that procced it in the first place, I suppose). gateways7 I get what you're going for, and it can work, but I do have some issues with it. Mainly, if you have multiple copies of it in your hand, how do you or your opponents know which one had which cards on it, particularly when an effect forces you to discard a card at random? What about if it gets discarded to your graveyard? When you get it back does it become Amalgamate again or is it still the two cards it exiled? I'll admit there may be some rules I'm unfamiliar with that explains some of this, but I still think the multiples thing stands. It's a fun card, I just don't know how usable it is, at least in paper. Really great entries this time around. It was honestly an incredibly hard decision, but I'm going to have to give the win to viriss, with Tesagk and kefke as runners-up. Fair enough. I can live with that. I guess I was thinking too much about, like, how this would play in Modern, where hexproof (feels like it) is more prevalent. The next set is Legions which takes place on the Dominaria plane. It has a lot of tribal to explore, including slivers (if that's your thing. viriss Oh god I just got into slivers like last week XD I had a friend years ago who had a sliver deck that was so damn annoying it put me off them for this long. 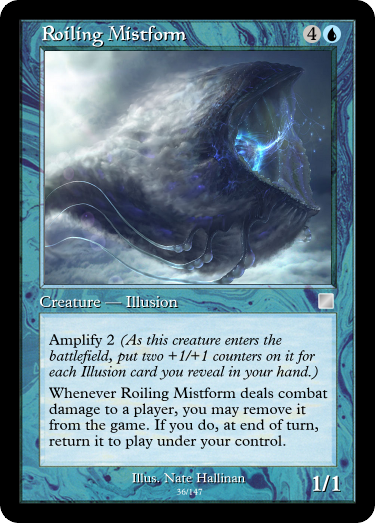 I realize that Amplify isn't in blue, but I feel like it can make sense with Illusions. Also, none of the Legions Illusions are saboteurs, so I figured I would shore that up. Whenever Roiling Mistform deals combat damage to a player, you may exile it. If you do, return it to the battlefield at the beginning of your next end step. If a creature you control dealing combat damage to a player would cause an ability to trigger, that ability triggers an additional time. , : Target creature you control gains flying until the end of the turn. Flavor: I've always hated slivers, but they like to work together, so I figured I'd focus on that. , : Create a 1/1 colorless Sliver creature token. Move X +1/+1 counters from Sliver Hatchmind onto that creature token. With the introduction of slivers in Legions as well as the second appearance of morph right after it's predecessor set Onslaught, I figured that it would be fitting to combine these two things. Although your opponent probably knows that a sliver is behind your morphs, he will still not know which of the many effects he will get into his face, making him more knowing but not less desperate. 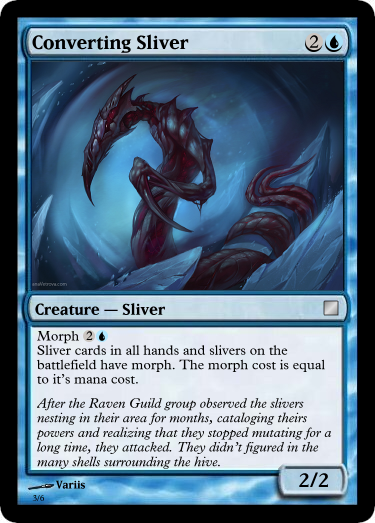 Of course, the morph ability on the Converting Sliver itself is pretty much pointless, but it wouldn't be a real sliver drone if it didn't have morph itself ;-) I thought about reducing it's morph cost to atleast give some gameplay sense to itself, but then it wouldn't have the perfect symmetry that slivers are known of. Also, although I dislike the old sliver ability of granting not only yours, but every sliver the ability, I stuck with it because that's the Legions wording and we have to design a Legions card.